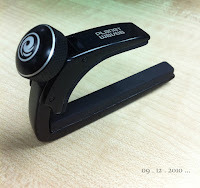 Recently I just purchased and received the Planet Waves NS Classical Guitar Capo from eBay.com. It was shipped by the USPS First Class Mail in a small parcel from the US Seller. The Classical Guitar Capo is different from the capo for acoustic guitar or electric guitar. It has to be a straight clip in to hold the strings properly and to prevent buzzing sound. It does a good job for my Jose Ramirez S1 Classical Guitar, after some testing. So far I'm really satisfied with the purchase. It clamps firmly on the guitar neck with an adjustable rotary dial. It is easy to spin the dial to tighten or loosen the capo. Based on the packaging description, it was mentioned that it was made of aerospace grade aluminium material. I'm not sure about it, but it's really light weight and compact in size. Before I bought this, I was hesitating if it could clamp well on the headstock. However, my logical sense tells me it could be possible. In fact after testing it, it is proved to be able to clamp on the guitar headstock nicely. Now I keep it clamped at my guitar headstock whenever it wasn't put on the guitar neck. I would give a 10 / 10 rating for this classical guitar capo.